The path leads you, defined by your ability to follow it unconsciously, to know where to turn. As unfamiliar as the journey seems, the path will take you home. Susan Hennelly, Linda T Hubbard, Elena Kalman, Paul Kmiotek, Pat Lane, Hannah Raine Brenner-Leonard, Carol Loizides, Anni Lorenzini, Amanda Lynne, Cynthia Newlin, Ellie Ritter, Peter Selter, Joan Gillman Smith, Jane Soodalter, Jeanette Sperone, Rebecca Tocci, Joann Zwolski. 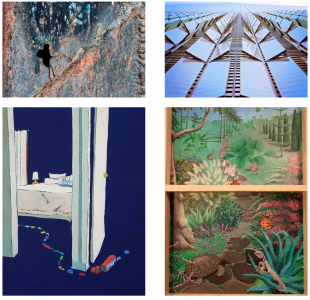 Grand Prize and Second Prize artists will receive a six-week exhibition at the gallery. Curated by Jeanette Rodriguez.